And so he did. 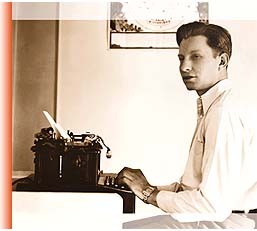 Beginning in the bleakest of the 1930s, when facing a blank page posed a challenge only writers of that era can appreciate, L. Ron Hubbard very literally piled up copy, stacked up stories and rolled out the wordage. Initially, he wrote for a variety of publications: he covered rodeos, air meets and motorcycle races for the specialty magazines. He supplied human interest features for Washington, DC dailies. He also scripted radio dramas, speeches, a substantial body of poetry and authored an award-winning one-act play, The God Smiles. But when readers of the day spoke of L. Ron Hubbard, they generally spoke in terms of his novels and stories as published in that now fabled Pulps. Stepson to the nineteenth-century penny novel, and named for the cheap pulpwood printing stock, the all-fiction Pulp still occupies a significant place on American literary shelves. In the twenty-year Pulp heyday between the World Wars, readership numbered in the tens of millions, while leading authors enjoyed legitimate stardom. In point of fact, the likes of Lester Doc Savage Dent, Norvell The Spider Page, H. P. Lovecraft, Edgar Rice Burroughs, Louis LAmour and, of course, L. Ron Hubbard were virtually household names. Moreover, if critics of the day tended to dismiss those Pulps as lowbrow escapism or prurient tripe, the best represented substantially more. Indeed, with Dashiell Hammett, Raymond Chandler and even a young Tennessee Williams also setting forth from between gaudy covers, the Pulps arguably provided as much to the modern American novel as a Hemingway or Fitzgerald. Then, too, with a full quarter of an American population regularly turning to those crudely cut pages, the Pulps introduced far more newly literate Americans to the sheer joy of reading than a Henry James or Stephen Crane.